The Cheese Steak Shop Philippines is not yet open to be sub-franchised in the country. This may take another few months or maybe in a year\\\'s time. What makes this franchise brand worth waiting for is its authenticity and how the master franchisee, Margaret Uy, stuck with all the things that make the Philly cheese steak one of the most-loved products in the United States. Opening its doors as early as July 2011, the Cheese Steak Shop has been a refuge for Filipinos and Americans alike who want an authentic taste of cheese steak. The Cheese Steak Shop franchise is the only known restaurant chain in Northern California that makes the tasty and original Philadelphia style cheese steak sandwich which combines the mouth watering taste of prime cut beef, grilled onions and cheese. Now, that’s one franchise brand worth waiting for, right? A brief history about the brand brings us back to 1982 in San Francisco, California where its first restaurant opened. Seven years later, a young Margaret Uy, who was then a student in Saint Mary’s College in Moraga, California, got her first taste of cheese steak sandwich at Walnut Creek. From then on, Mai could not get the idea of bringing Cheese Steak Shop to the Philippines off her mind. The store’s slogan “Caution: May be Habit Forming” became true for her. Unfortunately, Cheese Steak Shop did not franchise at that time. All stores were company-owned but Mai did not give up. Every time she went to the United States, she would visit the Walnut Creek outlet, eat her favorite Cheese Steak sandwich and check if they were already franchising. The opportunity finally came in 2010 when Cheese Steak Shop opened its doors to international franchising. She lost no time in organizing Cheesesteak Shop Philippines Incorporated. She personally attended the Franchise Operations Training Program of Cheese Steak Shop. 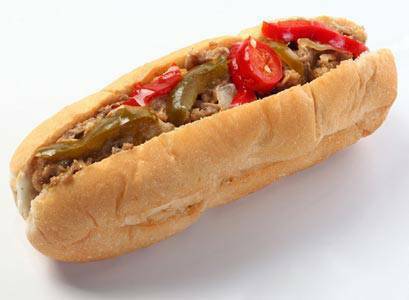 The exclusive contract authorizing the launch of several Cheese Steak Shop restaurants in the Philippines was awarded to Cheesesteak Shop Philippines Inc. within the same year. The Makati branch is the brand\\\'s first overseas outlet. If you want to know more about the Cheese Steak Shop or (keep your fingers crossed) try your luck if it’s already open for subfranchises here in the Philippines, you may send your inquiries to info@cheesesteakshop.com.ph or visit their website, www.cheesesteakshop.com.ph.